The small village of Lochawe is just a very short walk from the coach and has the Ben Cruachan Inn and the Loch Awe hotel serving food. There is also a post office/shop. In the village is St Conans Kirk, one of the most unusual church designs in the country. No car or don't want to drive? There are many local attractions you can visit by public transport. 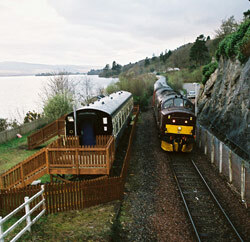 Loch Awe station is a stop on the West Highland Line from Glasgow to Oban. 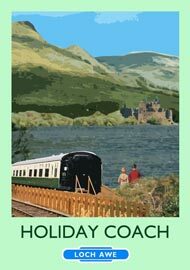 The rail link allows visitors to easily travel to the holiday coach and, together with the local buses that pass the road end, then reach many of the local places of interest by public transport. The Hydro-Electric Power Station (well worth a visit) within the "hollow mountain" of Ben Cruachan, is served by its own railway halt four miles from the coach. 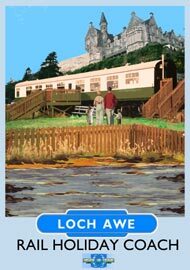 Within 20 miles of Lochawe there are a great many other places of interest and things to do. These include: cruises on Loch Etive, boat hire on lochs Awe and Etive, The Sea Life Centre in Oban, the Oban chocolate factory, The Inverawe Smokery (with excellent facilities for families), Inveraray Castle and Jail, Oban Distillery and many other places. Oban, just over 21 miles away, is an excellent shopping centre as well as a picturesque port from where ferries provide opportunities to travel to Mull, Iona and the many other islands of the Inner and Outer Hebrides. On Mull visit Duart Castle, on Iona there's the Abbey for quiet contemplation or visit Fingals' Cave on Staffa to experience what Mendelssohn did when he wrote the Hebrides - or Fingal's Cave overture. If you want to stay close to the coach then permits can be obtained from the village Post Office for fishing and there are nearby facilities for sailing and boating on the loch. Loch Awe makes the perfect holiday destination as a base for visiting the local places of interest or just relaxing by the water. Click Here to see Internet links to these and other places of interest. 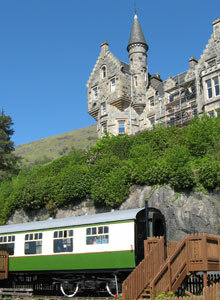 "Staying at the carriage was a 60th birthday treat from my wife. It's been the most fantastic experience." Steve, Birmingham.